Sting's fifth studio album, 'Mercury Falling', was also recorded at the 16th century manor house in England known as Lake House. 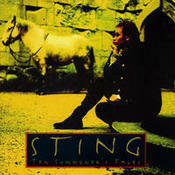 The album begins and ends with the words "mercury falling" and Sting has said that the symbolism of mercury is still prevalent in his music today. On which song from 'Mercury Falling' does Sting's former bandmate Gerry Richardson play? Please submit your answer using the form below by 11AM/EST tomorrow. Each correct response will be entered into a drawing and a winner will be selected, at random, and announced during the next day's post. Please note, each member may only enter once. This contest has now closed. The winner was Mickael Cohen who correctly answered Let Your Soul Be Your Pilot. In 1992, Sting moved himself and his family to a 16th century manor house in the English countryside and recorded the album 'Ten Summoner's Tales'. Answer the following trivia question for the chance to win an autographed copy of the album! Sting has published two books. 'Broken Music', his memoir published in 2003, spent 13 weeks on the New York Times Best Sellers list. 'Lyrics', published in 2007, is a collection of lyrics spanning his career. An accomplished author, Sting also enjoys reading a diverse range of books, from fiction to nonfiction, historical to contemporary literature. Leave a comment below telling us about your favorite book and why would you recommend it to Sting?